Samsung has announced pricing for its new Galaxy Tab 2 series, and fortunately the pricing structure for the 7 inch and 10.1 inch tablets seems to be a lot more competitive. Considering how many impressive Android tablets will be hitting the market this year, it seems Samsung is aiming to compete directly with Amazon's Kindle Fire and Barnes and Noble's Nook tablet (both 7 inch devices), while also dropping the price on their new 10.1 inch tablet as well. Mobile World Congress didn't bring too many details for the new Galaxy Tab series, as the Note 10.1 was Samsungs biggest announcement. But today it seems that the new series is directly in the spotlight, and that Samsung is proving even more that they are a serious contender in the tablet game. So how much moolah are we talking here? In terms of design change or features, there are a few changes. Design wise, the tablets look pretty much the same as previous Samsung tablets ( a few minor changes), but one really great difference is that they are both shipping with Ice Cream Sandwich right out of the box. The 10 inch version of the tablet has 16gb of memory, but adds a microSD card slot to extend the memory. It also features an IR port to allow you to use the tablet as a remote. Weight wise, they are pretty much on par with the Galaxy Tab Plus and Galaxy Tab 10.1 (original), although not identical in thickness or weight to their previous models. You're also given a year of Dropbox storage with 50GB storage, Remote Viewfinder software that can be used with Samsung wifi cameras,along with even more additional software. Will these tablets be iPad and Kindle killers? Probably not, but they are definately a step in the right direction. Hopefully, we will also see Samsungs new quad core devices in the coming weeks, or perhaps the rumored 11 inch tablet as well. Samsung to me represents the very best of Android in terms of design and marketing high end products, and I'm thrilled to see that they are aggressively trying to get their devices to the hands of mass consumers. 2012 is definetely shaping up to be a great year for Android tablets. 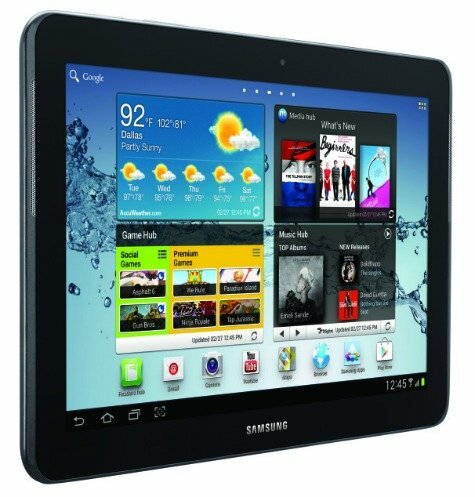 For instance the advertisement 4 the samsung galaxy tab .. Adds about apps that work 4 the new 4.0 phones which I don't own. I would be happy to look into this if you could give me a bit more information.